ISHMAEL – twelve sons, twelve tribes; “they lived in hostility towards all their brothers”. Great family values. JACOB AND ESAU – the Lord answers Isaac’s prayer for children; the babies jostled within her – “two nations are in your womb, two peoples, one stronger than the other, the older will serve the younger”. Esau, hairy hunter (Isaac’s favourite); Jacob, smooth homebird (Rebekah’s favourite). The birthright swapped for a bowl of lentil soup ! ISAAC AND ABIMELECH – Isaac has inherited his father Abraham’s tendancy to claim that his wife is actually his sister, because of a fear of losing his life. Isn’t it interesting how fears and quirky ideas can be passed down the generations ? This family need to snap out of this odd habit. The covenant promise is renewed with Isaac (precisely the same covenant promise give to Abraham). Sometimes God tells us to move, and sometimes God tells us to stay put (even when the grass appears greener elsewhere – e.g. more resources (less ‘famine’) elsewhere) – Isaac is reminded of God’s covenant promise and instructed to stay put in Gerar. Isaac becomes wealthy through God’s provision of good harvests. 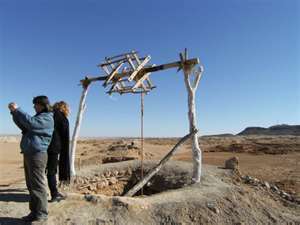 ISAAC OPENED THE WELLS – I love this image of reclaiming the wells his father, Abraham, had established. A symbol of recovering the places of refreshment, of renewal. 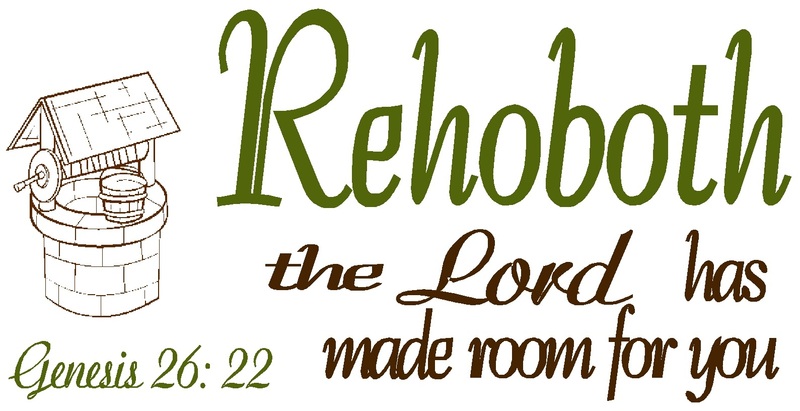 REHOBOTH (Now the Lord has given us room and we will flourish in the land) – I was moved by the sense that we all need room to grow and flourish. The earlier wells were ‘claimed’ by others, and that territorial grasping (‘that’s mine / ours, you can’t have / do that’) will always stunt others’ growth. ‘Rehoboth’ is so important, then – a God given space, breath of air, in which to really grow. BEERSHEBA – Isaac builds an altar, after God appears and clearly speaks His promise. “We’ve found water” – a reminder to me of Jesus being the water of life, offering springs of living water, and of the many encounters with God around wells and water (e.g. the Samaritan woman with Jesus). (Esau’s choice of wives “were a source of grief to Isaac and Rebekah” – oh dear…the in-laws). – Jesus sends out the twelve : noting here how Jesus “gave them authority to drive out spirits and heal”. – Right from the outset in Matthew’s gospel, Judas is identified as the betrayer. – Jesus initially sends them to the ‘lost sheep of Israel’ (the group of people most immediately around them and potentially ‘open’ to the news?). – “It is enough for the student to be like his teacher, and the servant like his master”. Lord, help me to be “like you” today, recognising that You are my teacher, I’m Your disciple-learner; You are my master, I’m Your obedient servant. – all will be revealed…..
– “don’t worry, even the hairs on your head are numbered, you are worth more than many sparrows”. God knows, God’s watching, God passionately cares for and loves you. PROVERBS – WISDOM is crying aloud in our streets, towns and cities, and people aren’t listening, aren’t paying attention. God is making His wisdom known, but it is being rejected. So, “they will eat the fruit of their ways, and be filled with the fruit of their schemes”. How humanity does reap what it sows. “Whoever listens to me will live in safety and be at ease, without fear of harm”. True contentment, (though not necessarily freedom from suffering and pain – cp. Jesus’s warnings about persecution, beatings etc. ), comes from listening to God’s wisdom, and discovering a true freedom from fear ! Isaac and Rebecca set up a habit of favouring one child over another (Jacob continues that habit towards his own children, when he favours Joseph….story yet to come)…family quirks passed down the generations. And there is something in these passages today about knowing where to find fresh water (the wells), hospitality, the room to grow and develop as disciples (some places we need to shake the dust off our feet), and that sometimes God calls us stay right where we are and be agents of change here and now. and drink deeply of the water of life. and free us to be your own people. Here and now, and for ever.